I really enjoy the outdoors and finding treasures to create things for the home. I am currently working with vines, moss, and dried botanicals, as well as silk florals and mushroom birds. When weather doesn't cooperate I sift through the fabric stash and warm up the sewing machine. Many types of crafting mediums interest me and I hope to add a variety of other handmade items as time goes by. I also do private home cleaning for a handful of families that are very dear to my heart in the Savannah and Richmond Hill area. I like to use all natural products, many of which I make at home myself. So please check in again to see what is new. Thanks for visiting today! 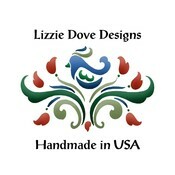 LizzieDoveDesigns doesn't have any items in their booth!